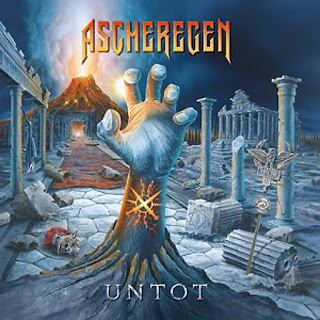 Βιογραφικό: «The band ASCHEREGEN was founded 2017 and is oriented to oldschool Heavy Metal from the 80s. Because of the German lyrics, they call it „Deutsches-Metal“ (German-steel). The music sounds like Metalbands from the 80s and been influenced by from Ozzy Osbourne, Dio or Accept. The reason of that sound is most of all the guitar work by Kratos P. The lyrics are presented in German language by Lilith Frost and Kaleun Cronos. The female and the male voice provide for the varied sounds of the songs. Daniel van Helsing´s keyboard gives main points and represents the Hard Rock of his earlier years. Δελτίο τύπου: «The German band ASCHEREGEN with "Tunes of war" (GRAVE DIGGER) - songwriting supporter A. Püschel and Kaleun Debus from Promoportal Germany, has finally released their long awaited debut album. Due to many publications the well known musicians, especially Andreas Püschel, who was already active in the 80s in German heavy metal bands like HAMMERSCHMITT or ASGARD, have decided to use German as a vocal language. German is sung by some bands; The combination of classic 80s influenced Heavy Metal with German lyrics is very rare and therefore particularly attractive.